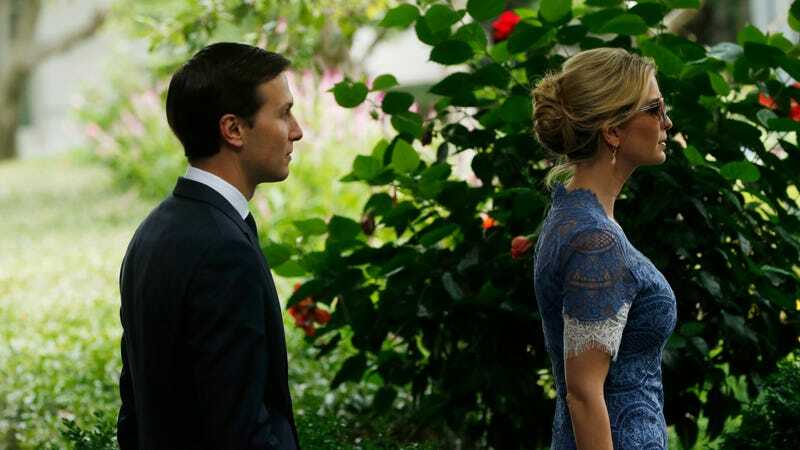 As criticism was mounting on President Donald Trump’s son-in-law Jared Kushner—as well as several other White House officials including his wife, Ivanka Trump—for using personal email addresses in the course of their official duties, the couple was busy moving the emails to a Trump Org. server. According to USA Today, Kushner and Trump “re-routed their personal email accounts to computers run by the Trump Organization” sometime between September 26-27th. Mere days later on September 28th, the Senate Intelligence Committee delivered Kushner a letter demanding he fully disclose any emails in the account related to ongoing investigation of alleged links between the Trump campaign and Russia. The internet domain Kushner used for his personal emails was first registered in December. In March, mail exchange records for Kushner and Trump’s family email domain, ijkfamily.com, directed messages to an email system run by Microsoft. The registration was updated at the end of September. Now it points to two mail servers used by the Trump Organization. According to Ars Technica, University of Pennsylvania computer science expert Matt Blaze confirmed there was no possibility the Trump Org. was simply providing a DNS server to ijkfamily.com to offset hackers. The decision to re-route the emails to a Trump Org. server is concerning, seeing as that’s the same ethically-conflicted business entity managed by the president’s two older sons, Eric and Donald Trump Jr. President Trump never divested from his holdings, and even if he had, continued management of the organization by family members raises massive conflicts of interest he shows little interest in redressing. Former federal prosecutor Renato Mariotti told USA Today the move “certainly creates the appearance of potential impropriety,” as it opens the possibility someone at the organization has access to the accounts. The last-minute switch also opens the possibility the couple moved the emails to the Trump Org. in order to have someone trusted remove messages from the account. Such a move would doubtlessly attract the attention of the various federal investigators working on the alleged Trump-Russia ties, like Robert Mueller, the Department of Justice special counsel who has been issuing numerous subpoenas—including to Kushner’s family businesses. “It looks like they were trying to keep the email from Mueller, Congress or both,” Richard Painter, former George W. Bush ethics czar and vice-chairman of Citizens for Responsibility and Ethics in Washington, told Gizmodo via email. The president, of course, has continued to hint he might direct the DOJ to prosecute 2016 Democratic nominee Hillary Clinton for her own extensive use of a private email server while serving as secretary of state.